from 11:00 a.m. to 1:30 p.m. Previously known as the City Hall Farmers Market, the new City Hall Local Lunch Market will offer the public a variety of prepared, ready to eat foods. Creative items by local artists will also be available for sale, all amidst Houston’s dramatic downtown urban setting. 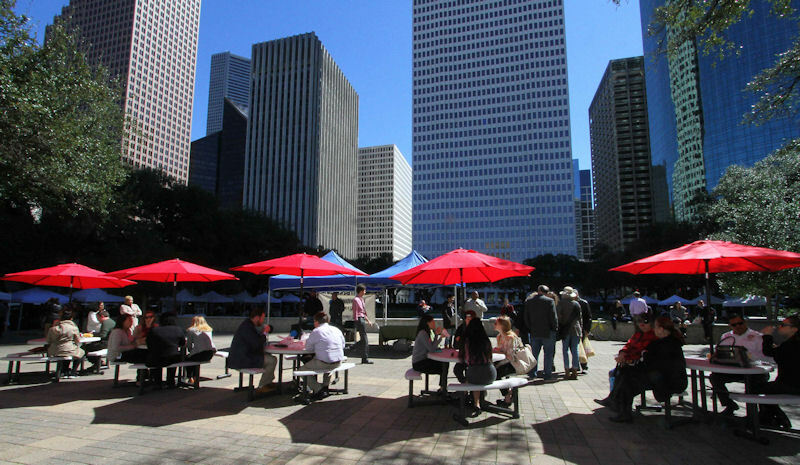 Each Wednesday through June 26, more than 30 food vendors will be outside City Hall. Entertainment is provided for attendees at the outdoor event via live musicians or DJs. The market also features food trucks along Walker and McKinney streets. 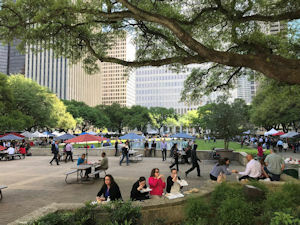 Downtown dwellers and employees are encouraged to walk, take the Greenlink (the downtown shuttle) or ride a bike via Houston Bike Share to the City Hall Local Lunch Market. Garage parking is located at 400 Rusk for a fee, and metered street parking is also available. For more information, visit houstontx.gov/specialevents/ or follow Houston Special Events on Facebook. For more information and to learn how to become a vendor, please contact Urban Harvest at or visit http://urbanharvest.org. For more information and to learn how to become a vendor, please contact Urban Harvest at 713.880.5540 or info@urbanharvest.org or visit http://urbanharvest.org.